Cosmonaut Oleg Kononenko is pictured with photography gear floating in front of him. The Expedition 45 crew is continuing more biomedical and psychological research today. Ground controllers are also remotely operating the Canadarm2 robotic arm for a video scan of Russian solar arrays. Flight Engineers Kjell Lindgren and Kimiya Yui were back at work Wednesday with more Ocular Health science conducting eye scans and cardiac exams. Lindgren also worked on gear that fuels combustion science experiments while Yui talked to his Japanese support team and cleaned inside the Kibo laboratory module. Commander Scott Kelly collected and stowed a urine sample for the Twins study then participated in research that explores how international space crews operate under stress. Kelly also replaced Trace Contaminant Control System gear inside the Tranquility module. Cosmonaut Sergey Volkov explored the effect of micro-vibrations in the Russian segment of the station. He also explored the relationship between a crew and Mission Control during a long term spaceflight. 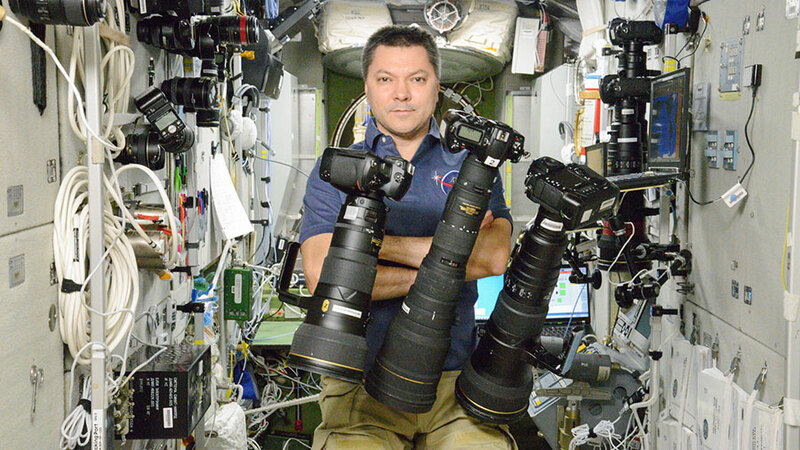 One-Year crew member Mikhail Kornienko studied chemical reactions in Earth’s upper atmosphere. He, Volkov and cosmonaut Oleg Kononenko also worked on Russian cleaning and maintenance tasks. All astronauts and cosmonauts have pride in their tasks.